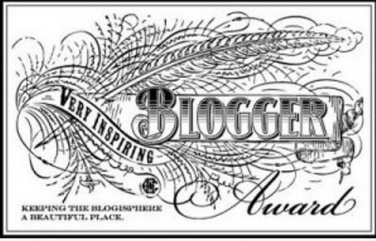 Let me say a special thank you to my blogger friend Zen of zenscribbles who graciously nominated me for the Very Inspiring Blogger Award. Zen is a writer and a foodie (usually desserts). She tells quirky stories which keep life interesting. Please take a moment to visit her blog. I squint a lot. Not because I can’t see but because I’m thinking. Squinting makes me think of the TV show Bones in which they call the super smart people who work at the Jeffersonian “squints”. Oh not to imply that I think that I am super smart. I am obsessed with using imdb.com. I can’t watch anything without looking up the entire cast. It shouldn’t matter but I just need to see who they are and what they’ve done before. I am a horrid housekeeper, decent cook, and SUPER wife and mother. Well maybe SUPER is an exaggeration so I’ll go with super. I can read in the car and feel sorry for people who get motion sickness when they try to do it. I got my driver’s license late in life (I was 20) and I barely passed. Why do you need to know how to parallel park? Anyway, I think my driving is indicative of the “barely”. Oh but I wasn’t driving during the Chicago fender bender (just saying). My kids have started asking for cereal for dinner. And I don’t have a defense to say no since it’s usually my dinner choice. Did I claim “super” mom-ness? Oh well.